The Makita 2012NB is a woodworking planer that is designed to provide an ultra-smooth finished surface on lumber, and it does an excellent job of it. This benchtop planer is rated highly in magazine comparison tests, and gets excellent user reviews overall. There are very few reports of failures, even though this model has been available for approximately ten years at the time of this writing. 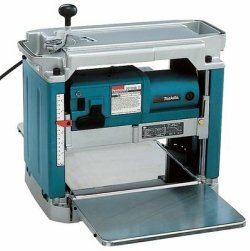 The Makita portable planer is one of the quietest (if not THE quietest) benchtop planers available. Weighing in at 62 lbs., it is also one of the lightest portable planers out there, which makes it one of the easiest to lug around from jobsite to jobsite if needed. The Makita 2012NB planer has a 12" width capacity, which is slightly less than the 12-1/2" or 13" capacity offered by some of its competitors. It has the industry-standard 6" depth capacity, and will take a cut up to 1/8" deep. The 15-amp motor spins at 8500 RPM, and the feed rate is 28 feet per minute. The 2012NB has a two-knife cutterhead with reversible blades, and takes 50 cuts per inch. The 4 post design and automated head clamp help reduce or even eliminate snipe. It comes with infeed and outfeed support tables that provide a total bed length of 30", which also helps prevent snipe. There is an adjustable depth stop for repeat cuts, and a removable tool box for storage of the blade tools and wrenches. Even though many of its competitors in the benchtop planer class have three blades and provide more cuts per inch, the Makita 2012NB is often praised for the smoothness and quality of its finish. WOOD Magazine did a comparison test of 11 different benchtop planers in their March 2010 issue, and the Makita 2012 was one of only three machines to receive an "A" grade for the surface finish (along with the Dewalt DW735 and DW734). The Makita portable planer tied with the Dewalt DW735 for the "Top Tool" award in that test, and came in second place in the snipe category. The Makita 2012NB was also featured in two separate benchtop planer tests in Fine Woodworking Magazine in 2009 and 2010. While it didn't win an award in either of those tests, it tied with the DW735 for the least amount of snipe in one test. In the other test, they said it was the best of the small woodworking planers, the most portable and compact, and was the only model that was ready to use right out of the box, no adjustments required. - So far, I have run 400' of South American cedar, mahogany & some oak with great results, mostly snipe free. It is very quiet at 83 decibels. It has very well placed handles so carrying is not a struggle. Good feed rate & easy to adjust the cutting depth. Most owners that I found are thrilled with the smooth-as-glass finish. There are numerous comments that there is little or no snipe, and there are fewer complaints of snipe than with other benchtop planers I have researched. It is common for folks to comment that it was set up perfectly straight out of the box, with no adjustments needed. Many people were impressed by how quiet the Makita 2012NB is in comparison to other portable planers. The 2012NB does NOT get some of the complaints that you see with other portable planers. I only found one owner that was not happy with the blade life, and one of the magazine tests actually said the knives in the Makita planer lasted longer than any of the other straight-blade planers in their test. I also did not find a single complaint that the blade screws seized or stripped out, like I did with several other brands. The most common complaint that I found is that the Makita 2012NB planer does not come with the dust hood; it is an extra-cost item that is available separately ($25-30 at the time of this writing). The dust hood also has a 3" outlet, instead of the industry standard 2-1/2" or 4" connection, although a hardware-store PVC adapter can be used to connect to a 4" dust collection hose. There were a few folks that had trouble with lumber not feeding in the Makita 2012 planer, but that is most often due to dirty rollers, not keeping the table clean and waxed, or having dull blades. Older reviews also said the owner's manual was poorly written, but the current manual on their website appears to have been revised since then. There were also older comments about poor packaging, but none that I found from the last several years. One last note to point out: With most other benchtop planers, one turn of the depth handle equals 1/16" of movement in the cutterhead. The Makita 2012NB planer was designed to metric specifications, so one turn of the handle moves the cutterhead 2mm. 2mm is essentially equal to 5/64" (1/64" more than 1/16"), which may take a little getting used to if you have been using a different brand of planer. Although the Makita 2012NB doesn't have all the bells and whistles or quite as much width capacity as some other benchtop planers, it shines where it really counts. This woodworking planer provides an excellent finish with fewer reports of snipe than most other models, and is very reliable and durable. Neighbors and family members will appreciate the lower noise level. Although it costs more than some other benchtop planers with similar features, long life from the dual edged knives means it can cost less to operate in the long run. If you can live without the extra 1/2" - 1" width capacity, the Makita portable planer is a great choice. There are a number of owners that said the Makita surpassed their expectations, and the overall ratings put it near the top of the portable planer class. However, if you are looking at portable planers in this price range, you also should check out the Dewalt DW735 and the Delta 22-590. They also get great reviews and are priced close to the Makita 2012NB.